The human voice is our most natural, completely self-contained instrument. Aside from speech, singing is one of the most natural way in which to express oneself. Even if you can’t “carry a tune”, singing surely fills an emotional need and should be encouraged. As is the case with other instrument, ability and perseverance are necessary for the finest possible production of musical sound. In fact, with the voice, there are added difficulties. It is not only a tone-generating mechanism, but it also has a power to couple tones with words and their components, vowels and consonants. Because of these multidimensional uses, it is the more necessary to care for the voice properly. How does the voice function? How does the voice function? The two vibrating strips of flexible or elastic connective tissue, known as cartilage and vocal cords, emit the actual vocal sound, like a vibrating metal strip does in an organ’s reed pipe. 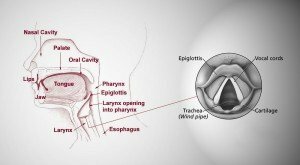 The vocal cords, enclosed in the larynx, vibrate by means of the wind supplied by our lungs via windpipe or trachea, which in turn branches out into the bronchial tubes connecting each of the two lungs. Wind is supplied by the bellow of the chest, to which the windpipe is connected, and sound is projected by way of the cavities of the mouth, nose and throat. If this sounds complicated, it is. However, since nature has supplied it all for us, we use this apparatus with comparative ease and are relatively unaware of its great complexity. Whereas people need to have their wind supply renewed at regular intervals, an organ pipe’s wind supply can continue indefinitely, as long as the bellows remain operative. A voice running out of breath is as critical to a musical performance as is the breaking of a violin string in the middle of a concerto. The flow of the performance has been interrupted disturbingly. Hence, breath control becomes equal in importance in vocal tone production itself. Vocal tone production is a challenge to music teachers and students alike. It must be based upon knowledge of the physiological realities, personal needs, and vocal characteristics of an aspiring singer – and above all, a lot of common sense. Since the voice is both a tone- and word-producing apparatus, proper diction, irrespective of the language used, is very importance. Diction involves enunciation and intelligibility of words. It is difficult to achieve while speaking, let alone singing, yet its absence is unacceptable, artistically speaking. Unfortunately, some of our finest singers – whose vocal instrument may be unmatched, wisely trained and developed – cannot project to an audience the message of their song because of poor diction, or no diction at all. In such cases, the question of substituting a translation versus singing in the original language of text, which is so frequently contested by music lovers and musicians becomes an academic one, since frequently not a word can be understood in any language. The voice is capable of all the nuances, innuendos, and expressive and interpretive details of any other instrument. Achieving this requires the insight, devotion, knowledge, experience, patience, and that constant “must” of any would-be performer – ability, if not talent – all of which apply to anyone wishing to become a musician. In the case of a singer, literally having to live with the instrument can be a mighty advantage.